AU Radar allows you to view the latest animated Weather Radar Loops from the Australian Bureau of Meteorology (www.bom.gov.au). Covering 53 locations around Australia - (where available) you can view IR Rain Radars (64km, 128km, 256km + 512km), Wind Doppler, Rainfall (since 9am, 1hr, 6hr + 24hr) - plus view the National Satellite and IR Rain Radar loops. Usage is fast and friendly - as it remembers you last location (and radar type) - meaning you get what you want instantly on load (after latest data is downloaded). 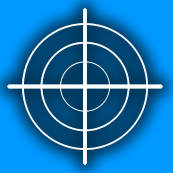 Finding your nearest radar is made simple by using your phone's GPS lookup - which provides you a quick list of the radar locations - or you can browse all the available locations by state. The App boasts a ton of great features - such as ability to pause/play loops, move to nearby radars (via a 8 way on screen compass), toggle display of imagery layers (such as topography, range and locations) as well as set the animation speed for the radar loop. The App is also super bandwidth friendly (and fast) - as all static imagery such as location backgrounds, topography and location overlays are pre-loaded into the App itself (no need to download them at all). Realtime imagery (such as the actual dynamic radar image overlays) are then downloaded from BOM as needed (and only uses a small amount of bandwidth - typically 2-15k per a 8 frame loop). Please Note : the trial version of this application will allow you to view only the 256km rain radar loop per each location - and all other radars will be available upon full purchase. Also note - that if using the GPS location lookup (optionally used when you nominate your radar location) - your location may be sent to Microsoft as part of standard statistics collection (which is a default requirement of using GPS capabilities on your handset inside applications). 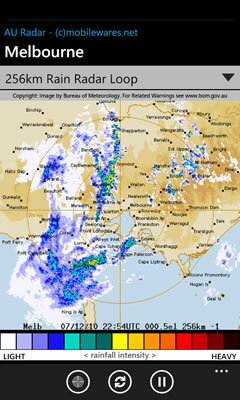 If you are after aus weather radar, this is great. As a roof plumber, I rely on this every day. Great app. Clean and simple. Does exactly what it promises to do. 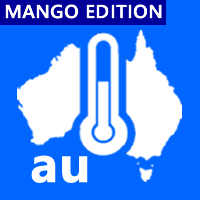 Nb: Above rankings/awards for 'AU Radar' are at time of updating this page.